A Bulawayo man who holds dual citizenship has filed an application at the Bulawayo High Court seeking an order compelling the Registrar-General Mr Tobaiwa Mudede to issue him with a passport after his application for a travelling document was turned down. Lionel Fredrick Taylor (29) is suing Mr Mudede, Home Affairs Minister Kembo Mohadi and the Minister of Justice, Legal and Parliamentary Affairs Emmerson Mnangagwa. Taylor, through his lawyer, Lizwe Jamela of the Zimbabwe Lawyers for Human Rights, accused the RG’s Office of violating his fundamental rights by refusing to issue him with a passport because he holds Zimbabwean and Mozambican citizenships. “I went to the Registrar-General’s offices in Bulawayo in October 2014 intending to apply for a passport. I was outrightly told by an officer that my application could not be entertained until I have renounced my Mozambican citizenship and apply for citizenship status in Zimbabwe,” said Taylor in his founding affidavit. Taylor said when he visited the RG’s offices in Bulawayo, officials insisted that they were governed by the policy that was in force before the promulgation of the new Constitution. He said he was born in Harare; his father was a Zimbabwean citizen and his mother a Mozambican. “My mother later on became a citizen of Zimbabwe by registration on February, 23, 1988. I have lived with my mother ever since l was born. I have known Zimbabwe as my home for my entire life and I hold a Zimbabwean birth certificate and identity document. I attended both primary and secondary school in Bulawayo,” said Taylor. He said his lawyer wrote a letter to Mr Mudede on October 17, 2014, explaining that he was a citizen by birth and as such was entitled to a Zimbabwean passport and the RG sought documentation to prove that Taylor was indeed a Zimbabwean by birth. “After furnishing the documents, officers at both Bulawayo and Harare RG’s offices still insist that I must apply for citizenship which costs $5 000. “I believe this is not necessary as I do not need to apply to be conferred with rights that are already conferred to me by the Constitution. I should be treated exactly the same way as any other citizen by birth as I am such. First respondent’s actions are becoming discriminatory towards me,” added Taylor. Jamela said the refusal by the RG’s Office to grant his client a passport is a violation of Section 35 (3) (b) of the Constitution. 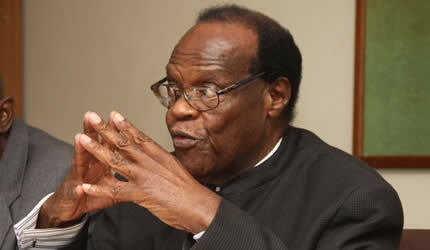 “The new Constitution does not require my client to renounce anything since he is a citizen of Zimbabwe by birth. “This application is of a constitutional nature and Taylor’s fundamental right as enshrined in the Constitution of Zimbabwe is being infringed by the Registrar-General as he had a right to hold a passport as a citizen of this country as enshrined in Section 35 (3) (b) of the Constitution,” said the lawyer. All the respondents in the matter are yet to respond to the application.